Every family has its own version of marinara sauce that’s been passed down from generation to generation. One of my favorite versions, Roasted Tomato Marinara, is delicious tossed with any shape pasta and sprinkled with parmesan cheese. Core each tomato and cut in half. Scoop out any excess seeds. Spray a rimmed baking sheet with cooking spray. Place the tomatoes (skin side up), onion, and garlic in a single layer on the baking sheet. Roast in the oven for 1 hour. Allow to cool slightly. Using your fingers, pull the tomato skins off of each tomato. Discard the skins. Scoop the tomatoes, onions, and garlic into a mixing bowl and mash with a potato masher. Stir in the fresh basil, salt, black pepper, and olive oil. Refrigerate overnight to allow the flavors to meld. I am so happy to see this posting ... definitely going to make it, especially with all of these tomatoes that I have. Thanks again for your inspiration! It looks delic! 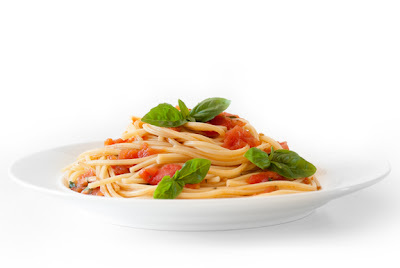 BTW, I think you are the only person that can make a plate of spaghetti look pretty!